by the Hellenic Economic Library Network (H.E.LI.N. 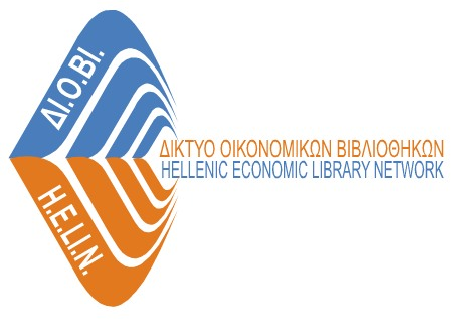 The Hellenic Economic Library Network (H.E.LI.N.) is organizing presentations of books that have been published by H.E.LI.N. members. The goal of the presentations is to showcase quality economics books and to promote the books as valuable informational tools. UNESCO has given the distinction of World Book Capital to the city of Athens for the duration of one year, from April 23, 2018 through April 22, 2019. The H.E.LI.N. book presentations will be included within the timeframe of this distinction. H.E.LI.N.’s second book presentation this year will take place on Thursday, May 3 2018, where the new edition of “Επιχειρηματικά Σχήματα Συνεργασίας και Επικοινωνία στον Τουριστικό Τομέα. Βήματα για αποτελεσματικές εφαρμογές” will be presented by the authors Maria Gousia-Rizou and Despina Sdrali. This publication analyzes the rationale behind the charm of diversity in business thinking and action by using a question and answer format. It also examines the need to adopt a communication strategy that emphasizes people and the needs that arise in their roles as tourists. The importance of cooperation and synergies is stressed, as well. Steps and best practices that can prevent repeated mistakes and that can determine creative and long-term trends in the tourism industry are discussed. The book will be presented by Paris Tsartas, Professor of Development of Tourism at the Harokopio University in the Department of Home Economics and Ecology. The authors, Dr. Maria Gousia – Rizou and Assistant Professor Despina Sdrali, will give a brief explanation and overview of the book. The event will take place at the Museum of the Bank of Greece, Amerikis 3, Athens, from 17.00 – 19.00. Entrance to the event is free. The registration form must be submitted electronically here. For more information, please refer to the H.E.LI.N. web page http://diovi.lib.unipi.gr/ and to the social media Facebook: ΔΙΟΒΙ and Twitter: diovi_helin. Seating is limited and will be done in order of priority. Please note that the entire event will be in Greek. For further information, please contact the Library and Information Center at the Harokopio University at 210 9649 170 and 210 9540 169.